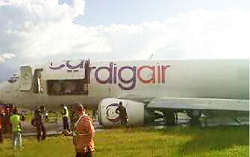 The 737 cargo aircraft was substantially damaged in a landing mishap at Wamena Airport, Papua, Indonesia. Reportedly the aircraft undershot runway 15 touching down ahead of the runway threshold. As a result the undercarriage was damaged and the left maingear dug in causing the left wing to drop and the left engine pod scraped on the ground before the 737 came to a stop in the vicitiy of taxiway „Echo“. 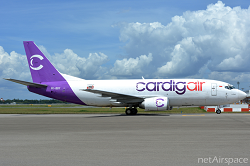 The aircraft carried a cargo of 30 tons of rice. At the time of the landing, the skies were clear but a gusty wind was blowing along the runway with velocity peaks of 20-25 knots. 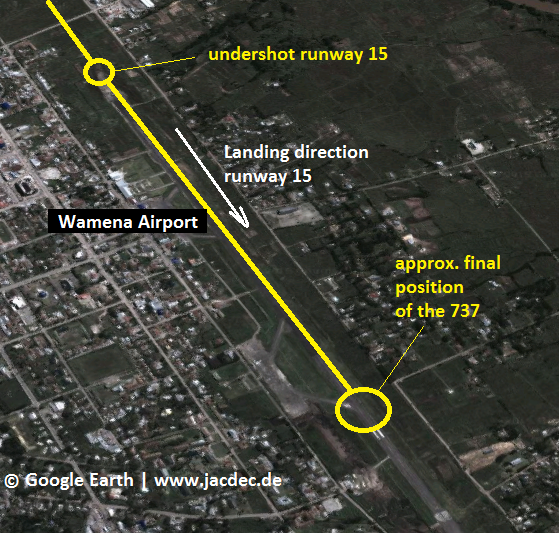 The Boeing 737 ist the largest aircraft allowed to land at Wamena and pilots often aimed their touchdown point closer to the threshold to save a maximum of landing distance for stopping.